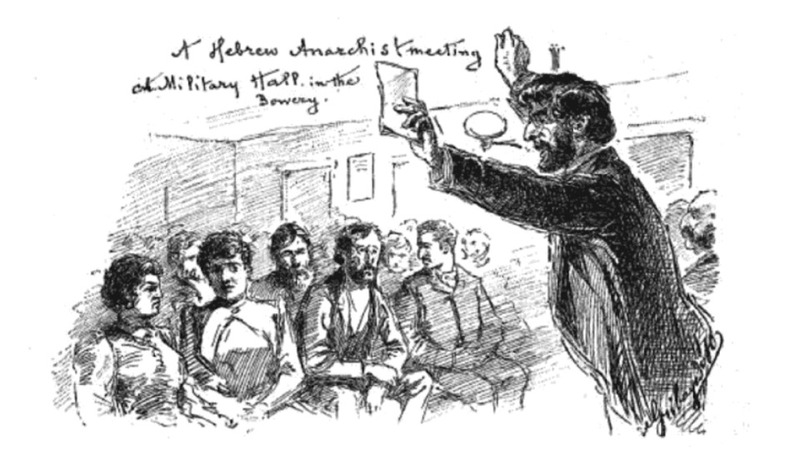 “A Hebrew Anarchist Meeting at Military Hall, in the Bowery,” Harper’s Weekly, August 20, 1892. Kenyon Zimmer, assistant professor of history at the University of Texas at Arlington, has written a comprehensive treatment of the American anarchist movement. It is a volume in the series Working Class in American History, edited by a team of renowned scholars. His six chapters, plus an introduction and conclusion, are dense concentrations of personalities, dates, publications and editors, exclusionary laws, red scares and deportations, relationships with other ideologies in their national communities (such as Zionism or fascism), and with other tendencies on the left—socialism, the syndicalism of the Industrial Workers of the World (IWW), unionism, and later, communism. The research is dizzying, and critical, for here are the roots of American radicalism, and the starting point for many prominent individuals who would make their mark in American unions, in the Socialist and the Communist parties. 6 “No Right to Exist Anywhere on This Earth”: Anarchism in Crisis. 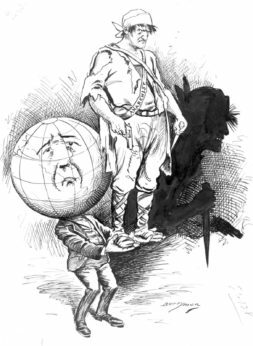 Clifford Berryman, “What to Do with Him Is the Problem,” 1898 / National Archives. The stereotype of the anarchist as violent revolutionary. Many of the 1886 Haymarket martyrs—from whom America gave the world May Day—were immigrant anarchists. But the peak for the anarchist movement was “around 1910 at probably more than a hundred thousand.” By going into the personal biographies of many of the movement’s leaders, Zimmer shows how “the majority of foreign-born anarchists were not yet anarchists when they arrived in America.” It was not “foreign influences” that radicalized them but the conditions they found on these shores and in our sweatshops. Zimmer concentrates on the Italian and Jewish communities. By 1910 they were the two largest immigrant groups in America, with the most highly evolved anarchist movements. He says “Yiddish,” though, rather than “Jewish” to distinguish between the older German Jewish crowd, many of them now well established in America and who disdained the crude sounds of the Yiddish “jargon” spoken by their co-religionists from Poland and Russia. Yiddish speakers were the anarchists, although interestingly enough, many of them learned the language only in America. I had not previously encountered this nuance of thinking, but Zimmer makes a valuable point. It would be difficult to understand the sweatshop strikes, the struggles against repressive religion, the resistance to landlords, and to government authorities that flouted as much as obeyed the Constitution, without knowing more about the Yiddish rebels of the Lower East Side and the Italian wool and silk weavers not far away in Paterson, N.J. In both communities language produced a certain insularity as it also served as a nurturing mother to the movement. 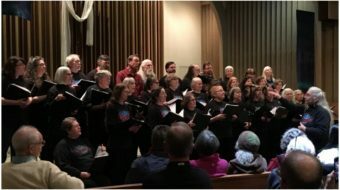 But the anarchists also reached out to other national groups in solidarity, as well as to Black Americans they saw as equally exploited fellow workers. Jews were linked historically to the great Russian revolutionary tradition, even before 1917, while Italians could in many ways relate to the radical national movements of Garibaldi and Mazzini. I could more deeply appreciate from Zimmer than I had ever before, how attuned the intellectuals of the Yiddish press were to world thinkers, such as Kropotkin and Marx, and even to domestic writers such as W.E.B. Du Bois, whose treatment of “The Souls of White Folk” appeared in translation in the Fraye Arbeter Shtime (the Free Workers’ Voice) in 1911, only months after its publication in English. Zimmer documents the trans-Atlantic comings and goings of numerous significant writers and organizers whose devotion, and whose suffering at the hands of governments, were models of martyred self-abnegation. He also shows how in their own families and social organizations the anarchists displayed many of the prejudices of their day, particularly in the lesser roles they assigned to women. And he opens the reader’s eyes to the many sub-varieties of anarchism that pitted advocates of large-scale organization against those who preferred working in small affinity groups, that placed propaganda by the deed against militant pacifism, that favored entry into imperfect unions and contracts against others who preferred the wildcat life. Tied closely as he is to the sources he has mined so richly—he obviously reads both Italian and Yiddish—still there were times I would have liked him to step back to take in an even wider picture. Now my own predilections emerge: Did the Italian anarchists enjoy opera, for example? At home, that was popular culture; did that translate to America, or did the anarchists dismiss it as too bourgeoisified here for their taste? And did the Jewish anarchists attend the ubiquitous Yiddish theatre? Did they read and debate the greats of Yiddish literature such as Sholem Aleikhem, I.L. Perets, and Mendele Mokher Sforim, all of whom had profound humanitarian values, if not also radical ideas? Maybe such references did not surface either in the printed record or in the interviews Zimmer conducted with activists and their children. It seemed to me that Zimmer painted his subjects into more of an ideological corner than perhaps characterized the actual lives they were living. Over time, many of them, especially once they started sending their kids to public schools, did find some resignation integrating into our flawed market-oriented space, a trend he does remark upon wistfully as he cites how little of the ideology passed on in both communities to the next generation. It would perhaps take the insight of an anthropologist more than a historian to completely understand how intimately ideology connected to language, and how much less communicable those ideas became when they had to be expressed in English. San Francisco was another, lesser engine of anarchism, but far more internationalized, and less Eurocentric, than the East Coast cities. In California many of the anarchists were inspired by revolutionary developments in Mexico, and gathered arms, money and volunteers. Most of their illusions came to naught, but for a few brilliant moments it looked as though the world revolution was going to be launched just across the border. Zimmer examines what evidence remains of the Chinese, Japanese and Indian anarchist movements. World War I, the Espionage Act, the Russian Revolution, the Palmer Raids, deportations and incarcerations, all took their toll. The Great War posed questions of national independence and democracy in opposition to empires and monarchy. Were all statist expressions equally pernicious, or some more hateful than others? Could Russian anarchists, and others repatriated there after the American deportations, affect the course of the Revolution at the outset? 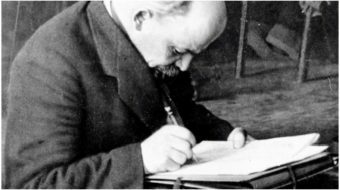 At what point would anarchists say, Now the Bolsheviks have gone too far; or would they give up some of their scruples and join them—either opportunistically or possibly out of sincere conviction for the greater good? The Great Depression forced anarchists to accept government handouts—anathema to them—in the form of a job or food rather than starve. Persistent anti-Semitism in Europe made some anarchists wonder if in Zionist Palestine they could live, reasonably principled, on the kibbutz. The last great gesture of world anarchism came in the Spanish Civil War—or the Spanish Revolution, as the anarchists saw it. Although in the doldrums in most of the rest of the world, Spain’s anarchist movement had its own historic arc. In the establishment of a republic in 1931 that promised to set aside centuries of absolutism and religious obscurantism, anarchists envisioned an opening to realize long-held dreams of creating a revolutionary society of a new type. Together with socialists, in that brief interregnum that permitted it before Franco’s nationalists with fascist aid claimed victory, anarchists took over and collectivized vast tracts of agricultural land, a number of key factories and public utilities, such as the telephone service. Certain areas, above all Catalonia, proved that the ideals of masses of anarchist militants could be achieved. Anarchists worldwide harkened to the Spanish call. But Republican Spain was caught between fascism on the right and communism on the left. For the first couple of years, 1936-38, the USSR was the only supplier of weapons against fascism, and most of the International Brigades that went to defend the Republic were communists. In Spain, they saw the first act of the cataclysm that would soon become World War II. The anarchists themselves were split in bitter controversy over whether or not to join the Republican government and commit their forces to its command, or go it alone against both sides. Ernesta (Ernestina) Cravello, “Queen of the Anarchists,” Evansville Courier, August 5, 1900. From then on, in America and in the world, a few publications survived, an occasional new little group emerged, some ideas—about human sexuality and gender relations, education, diet, housing—claimed anarchist inspiration. But serious thinking beyond the state would for the foreseeable future be forever deemed marginal to the principal struggles of the day. Such was the case with the lonely last lion of American anarchism, Sam Dolgoff, whose biography by his son Anatole we reviewed in PW. In his short conclusion Zimmer takes pains to emphasize how anarchist anti-communism was a far cry from the McCarthyite variety. “Anarchists did not support government repression of Communist Party members and none served as informants for anticommunist congressional committees.” And he feels that the anarchists merit some vindication in hindsight: “Their critique of democratic republics’ inability to resolve class conflict, their warnings about the dangers of nationalism and socialist dictatorship, and their predictions of inevitable conflict between Zionists and Palestinians all proved substantially correct.” Their ideals may have been naïve, but what other ideologies have not ended in some form of betrayal? Even if by any measure anarchism is now but a minuscule element in our political culture, it still exerts influences both healthy and toxic. The Occupy movement for a time captured the imagination of young people; some of its participants learned from it that more organizational discipline, rather than less, was needed to make any of the societal change they professed to be seeking. Others perhaps just dropped out, disillusioned, overwhelmed by a sense of futility. Those who declined to dirty their hands by voting for a capitalist party in 2016 gave the world Donald Trump as a reward for their purity. 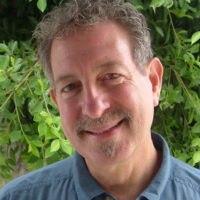 Zimmer’s title offhandedly references a classic 1953 work by James J. Martin (1916 –2004) on the history of 19th-century American individualist anarchism, Men Against the State, a book known to every American scholar of anarchist thinking. Martin resurrected the ideas of native-born thinkers such as Benjamin Tucker, Josiah Warren, Lysander Spooner, and J.K. Ingalls, among others. They rejected collectivist solutions—as did many of the Italian and Yiddish anarchists Zimmer writes about. Some, in their rejection of the “state,” drifted into what we would today call “libertarianism,” i.e., no legal restrictions on people’s rights in the marketplace. Martin himself later drifted into revisionist history and became known for espousing Holocaust denial. Surprisingly, Martin’s title does not appear in Zimmer’s extensive bibliography, perhaps owing to the fact that among the American thinkers named above, only Benjamin Tucker gets a passing mention. The immigrant anarchists were apparently ignorant of native strains of freethought, to which likely they could only tentatively relate anyway owing to vast differences in culture, privilege, locale and class. Zimmer has produced a volume of incomparable scholarship. His narrative chapters take up the first 213 pages illustrated by more than a dozen contemporary photographs and drawings, followed by 36 pages of citation notes, a 27-page bibliography, and a comprehensive 19-page index. The book concludes with a listing of the almost 100 titles released in the Working Class in American History series to date (2015); there are more titles, on a truly astounding variety of topics, by now. I would guess a high number of them are book versions of PhD dissertations. It’s a serious study that is clearly not meant to be “read like a novel,” but as a work of scholarship in a field of profound interest to radicals, it merits a worthy place on your shelf.